• Count: the number of decodes of this station. • ID: ID number of the station, stations transmit either the ID or one of the reference IDs. • RefID1: The first reference ID of the station. • RefID2: The second reference ID of the station. • Baud: The baud rate, 100 or 200. • km: The distance to the station from your location. • deg: The bearing to the station from your location. I've updated this app with a new version, 0.2.0, which adds a bunch of features, including the ability to decode from regular WAVE audio files, if you do not have an SDR. 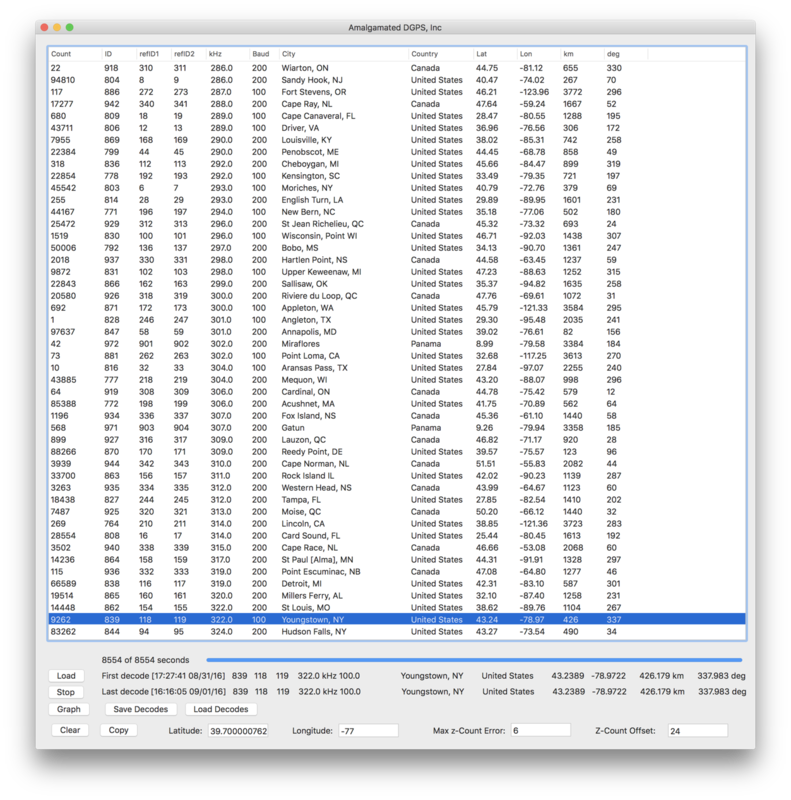 The app can decode from multiple DGPS channels in the same WAVE file, as many as fit in the bandwidth. So if, for example, your radio is tuned to 300 kHz USB with a bandwidth of 6 kHz, then 301 to 305 kHz fit inside and will be decoded. You could of course tune to say 299.5 kHz and squeeze in another channel. Or make the bandwidth wider. Or both! Version 0.3.0 for Mac OS X has been released. This version adds live decoding from an audio input. 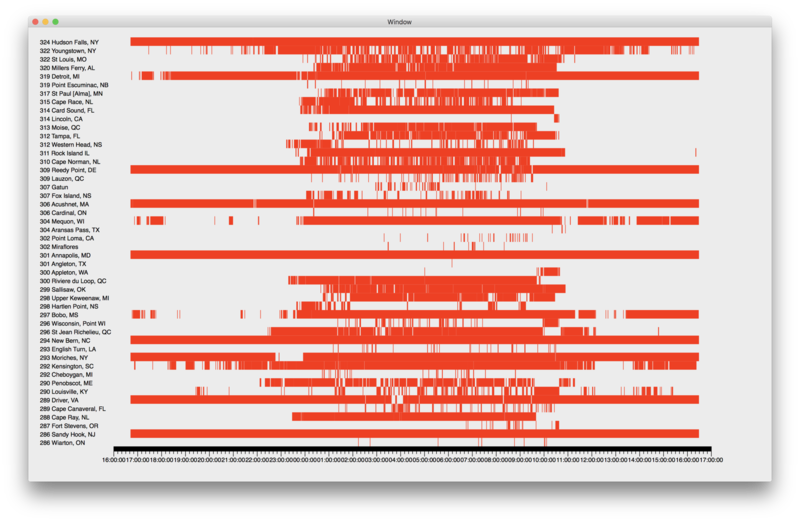 It also adds a window of UNID stations (those that were received but the ID does not match any known ID/frequency/baud rate combinations). There's also the usual bug fixes. Live decoding of audio was the last major feature that needs to be added. So now the task of making a Windows version can begin. So is the software smart enough to triangulate your receive location based on receive timing, et al, or do you tell it where you are? You have to tell it where you are located. I'm not sure that the transmissions are synchronized to UTC time, allowing for triangulation based on the time delay. Wake the kids and phone the neighbors, Amalgamated DGPS is now out for Windows! It seems to work OK, I've done all my testing on Windows 10. It should probably work on 7 and 8, maybe Vista and XP? Try it and let me know. This is the first release of a Windows version, so there are likely still some rough edges. It decodes from both WAVE files and I/Q recording files from several popular SDR programs. I also decodes from live audio. It will decode as many DGPS channels as can fit in your audio passband (assuming your computer can keep up), I've been able to go up to 19 kHz wide. I've found a typo a few days ago: #667 Ulling Do, South Korea, 319 kHz is showing station #001 Ull every time it is logged. The RFId is correct/the one assigned. Also #821 Portsmouth C2CEN, VA, 313 kHz has been off air for over two years. #821 shows up occasionally and is a false decode. It is/was a testing facility for the USCG. Next, we know there is a problem with the ADGPS RFId display. Is it your intent to show the assigned RFId's or only the received RFId? I would prefer to see what ADGPS received to further verify the log and for submission of logs to Rxx. Interestingly, I have been seeing a lot of logs from South African stations primarily #203. Building up over a week or so from one log at a time to 4, 5, 6 daily logs. Accompanied by usually another AFS station but they only log one hit. The interesting part is that the logs are happening during AFS local daylight morning/early afternoon time (+9 hours from here - nighttime here on the left coast)! A few days none are logged but seem to follow the daily ebb and flow of what I log on HF DSC from Cape Town 8 & 12 mHz. I listened to the Perseus SDR audio I/Q stream of several of these AFS #203 logs and it sounds like the USA station on this channel, #828 Angleton, TX fades/flutters. I ran DSCDecoder at the same time (I knew it would not log #203 as it takes DSCDecoder about 12 seconds to sync) but it skips a few seconds of solid decodes of #828 and then ADGPS logs #203 during these "skips". I checked down to the exact seconds. Interestingly some of the ADGPS daily logs seem to show a pattern of LF propagation to some regions. Finally, I read somewhere in the description of ADGPS that the user would have access to the station list. I did not find that function in the windoz distribution of ADGPS. Would like to see that to eliminate the "clutter" of truly impossible logs like India, Egypt and so on. The Graphing function is also kool Chris. Once in a while it shows a gradual slope of decline in logs but mostly peaks and valleys then a decline near local daylight. Thanks for the info about #667 and #821, I've corrected them in the station listing. I have noticed #821 popping up every now and then, with very few decodes, considering how close I am to Portsmouth, I assumed I would be getting more decodes if it was actually on the air, but did not know what the actual status was. I'll have to look and see how difficult it would be to report the actual received RFid, right now the software does display both of the assigned values. It might be possible to display the received RFid in bold? The app will look for your own copy of the station list, named dgps_station_list.txt and if it finds it, will use it in place of the built in list. I do find pattern(s) of stations fading in and out, and propagation in general, very interesting. Sometimes you can see correlations between stations in the same general geographic area, and other times you can't probably because what you receive/decode is a function of not only whether that station's signal is making it to your QTH, but also whether there is another, interfering, station being received on the same frequency. It seems the more I learn about propagation, the less I know. Impressive software and some good DX. For those that may be interested, Card Sound Fl is at the SE tip of Florida. What antenna were you using? Thanks for the info. Quite a list in the LW forum. I listened a bit just now with my TS-480SAT and the HyGain vertical and was able to hear more stations than I thought I would be able to. Watching the signals on Spectran and they are pretty distinctive. I will see if my neighbor will let me run a long wire across the back of his property. Installed the software on one of my win 7 computers yesterday. Still using the Kenwood and HyGain but pretty good results so far. Cool stuff, I needed something to keep me from working DX on 40 at night. The bandwidth only allows receiving about 3 or 4 stations at a time though. Also decoding a WinRadio I/Q file is a problem: it is 32 bits, 40 kHz bw, stereo. Thanks, I deleted #877 Pahoa, it will be reflected in the next update. Can you save 16 or 24 bit I/Q data? I am not aware of other SDRs that record the data as 32 bits, and there's likely no meaningful data in those extra bits, so I would prefer to not add a special case for processing 32 bit files. Also, I am not sure what is meant by stereo, as these are I/Q data not audio, or is that their way of signifying that the files contain two channels of data, I and Q?